Check Procedure to Switchover from CA Old Syllabus to CA New (Revised) Syllabus. In our previous articles, we have given CA CPT, CA IPCC and CA Final new syllabus applicable from May 2018. Today we are discussing the process to convert from CA old syllabus to CA new syllabus. We already knew that The Institute of Chartered Accountants of India has revised CA syllabus which is applicable from 1st July 2017. So, old registration students have some doubts that whether CA new syllabus is applicable to us or not?, Up to which attempt we can write their exams in the old syllabus? how to switch over from old course to new course? how much fee we have to pay?. Therefore, we are going to discuss all these queries here. Let’s check them below. Transition Scheme for students of Common Proficiency Course, Intermediate (IPC) Course and Final (old) Course along with the Conversion Fees for Switching Over to Revised Scheme. After appearing in Class 12th exam, students may convert to Foundation Course under revised scheme at any point in time w.e.f 1st July 2017 or compulsorily have to convert after completion of the available attempts, i.e, June 2019 under old scheme, by paying conversion charges of Rs.500/- (US$ 40) and the study material for revised scheme will be provided free of cost but shipping charges will be borne by the students. They may convert to Foundation Course under revised scheme at any point in time w.e.f 1st July 2017 or compulsorily have to convert after completion of the available attempts, i.e, June 2019 under old scheme, by paying conversion charges of Rs.500/- (US$ 40) and the study material for revised scheme will be provided free of cost but shipping charges will be borne by the students. Such students would be eligible to appear in immediate Foundation Examination to be held after switching provided that the student has passed class 12th Examinations. Implementation Schedule of CA Foundation Revised Course from 2018. May convert under revised scheme at any point of time wef 1st July 2017 or compulsorily have to convert after completion of the available attempts i.e till May 2019 under old scheme by paying conversion charges of Rs.1000/-(US$ 50) and the study material for revised scheme will be provided free of cost but shipping charges will be borne by the students. 1. Will undergo ICITSS (ITT)/ICITSS (OC)/ICITSS (ITT & OC), to the extent not undergone ITT/OC/ITT & OC under old scheme. Thereafter, may commence Practical Training. 2. Such Students may appear for Group-II under the old scheme for all available attempts, i.e, until May 2019. May convert under revised scheme at any point of time wef 1st July 2017 or compulsorily have to convert after completion of the available attempts, i.e, till May 2019 under old scheme by paying conversion charges of Rs.1000/- /-(US$ 50) and the study material for revised scheme will be provided free of cost but shipping charges will be borne by the students. 2. May appear for Group-II under the old scheme for all available attempts, i.e, until May 2019. May convert under revised scheme at any point of time wef 1st July 2017 or compulsorily have to convert after completion of the available attempts i.e, till May 2019 under old scheme by paying conversion charges of Rs.1000/- /-(US$ 50) and the study material for revised scheme will be provided free of cost but shipping charges will be borne by the students. 2. Such Students may appear for Group-I under the old scheme for all available attempts, i.e, until May 2019. May convert under revised scheme at any point of time wef 1st July 2017 or compulsorily have to convert after completion of the available attempts i.e till May 2019 under old scheme by paying conversion charges of Rs.1000/- /-(US$ 50) and the study material for revised scheme will be provided free of cost but shipping charges will be borne by the students..
May convert under revised scheme at any point of time wef 1st July 2017 or compulsorily have to convert after completion of the available attempts, i.e, till May 2019 under old scheme by paying conversion charges of Rs.1000/- /-(US$ 50) and the study material for the revised scheme will be provided free of cost but shipping charges will be borne by the students. May convert under revised scheme at any point of time wef 1st July 2017 and appear for Intermediate Examination after being eligible or compulsorily have to convert after completion of the available attempts i.e till May 2019 under old scheme by paying conversion charges of Rs.1000/- /-(US$ 50)and the study material for revised scheme will be provided free of cost but shipping charges will be borne by the students. Such Students may appear for all available attempts , i.e, till Nov., 2020 under old scheme Undergo AICITSS (Adv. ITT)/AICITSS (GMCS) / AICITSS (Adv.ITT & GMCS), to the extent not undergone Adv. ITT / GMCS / Adv. ITT & GMCS under old scheme. Have to undergo before applying for Membership of ICAI. May convert under revised scheme at any point of time wef 1st July 2017 or compulsorily have to convert after completion of the available attempts, i.e, till Nov. 2020 under old scheme by paying conversion charges of Rs.1000/- /- (US$ 50) and the study material for revised scheme will be provided free of cost but shipping charges will be borne by the students. Such students will undergo ICITSS (ITT)/ICITSS (OC)/ICITSS (ITT & OC), to the extent not undergone ITT/OC/ITT & OC under old scheme before appearing for Final Examination under Revised Scheme. May convert under revised scheme at any point of time wef 1st July 2017 and appear for Final Examination after being elected or compulsorily have to convert after completion of the available attempts i.e till Nov. 2020 under old scheme by paying conversion charges of Rs.1000/-/-(US$ 50) and the study material for revised scheme will be provided free of cost but shipping charges will be borne by the students. All the students while converting to Intermediate or Final course will get the study material free of cost on converting but the shipping charges are to be borne by the students. The announcement relating to the criteria of the grant of exemptions under the revised scheme for existing students in respect of the group/paper qualified by them under the old scheme will be hosted separately. How to Convert From CA Old Syllabus to New Syllabus? Step by step procedure to switchover from CA old syllabus to CA new syllabus. Then you have to enter your registration number and date of birth. If you enter your details correctly, then your details will appear on the screen. Then, you have to fill your Email, Phone number. Also, you should set a password. When you click on the link REGISTER, ICAI will send an OTP to your mobile. Login to your Email and Password. Once login, you can see an application form which you have to fill your Father’s name, Mother’s name, address. You should also upload scanned copies of your photo, school/college leaving certificate and signature. After successful payment, you should print out your application form and submit to ICAI regional office. 4. Use your own email id and mobile number, future communication related to this portal will happen to them only. 5. Once registered an OTP (one-time password) will be sent to your registered email id/mobile number. Enter this detail in User verification screen. 7. If OTP is not received immediately then do not panic, it may receive after some time. After some time, you need to login again with your registered email id and password. Once verified you will be diverted to OTP verification screen, now enter received OTP and submit. 8. In your dashboard, list of the application form which you have applied will be displayed with status and form acknowledgment number. If you click on the acknowledgment number, the form submitted by you will be displayed (of which you can take printout and submit to ICAI Regional Office). 1. Always verify details entered before clicking on "Save and Pay" button, once clicked you will be diverted to payment gateway screen. 2. Enter payment gateway details and then proceed for payment(Here do not refresh or go back to the last page). 5. In case even after 2-4 days, the status of your application is displayed as "Payment not verified/confirmed", then confirm with your bank first and then contact us. I hope this article will help you to check procedure to convert/switchover from CA old syllabus to CA new syllabus. If you still have any doubt, feel free to reach us at contactus@caprep18.com or on our toll-free number 1800-212-8575. 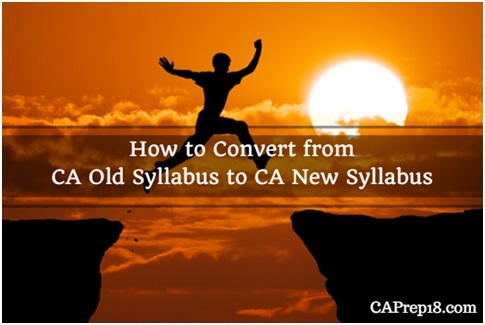 Also, share this article “ How to Convert from CA Old Syllabus to CA New Syllabus | Transition Scheme “ to your friends who are going to switch over their syllabus.